While building the 10 MW New Jersey Oak Solar project, Lincoln Renewable Energy ran into some big time weather including Hurricane Irene, followed by a snowstorm in October—and an earthquake. What is special about the New Jersey Oak Solar project in Cumberland, New Jersey's Fairfield Township? For starters, the 101-acre site contains 53,200 fixed solar panels, produces 10 megawatts of AC power (enough energy to support 775 homes), and is the largest non-utility-owned solar project east of the Mississippi, according to Lincoln Renewable Energy (LRE). Back in 2009, LRE was looking at two primary markets for solar—California and New Jersey. "We felt at the time that the California market had significantly more competition for utility scale solar than New Jersey, so we started our greenfield development in New Jersey. It was our first area to develop," says John Stone, vice-president, project management at LRE. Macquarie Energy LLC entered into a long-term purchase agreement for the power and renewable energy credits from the NJ Oak project and also provided construction finance and term debt to the project. Stone, speaking about Mac-quarie says, "I think that there are different types of customers in the energy marketplace. Some are your traditional utility offtakers, and some are traditional power marketers, which I feel Macquarie Energy is. They are into power marketing and power sales." 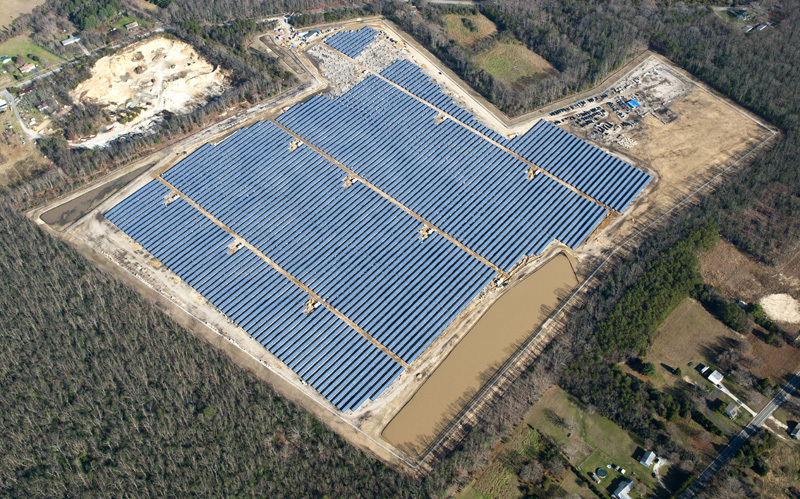 The solar project is located off the main highways in Southwest New Jersey. Although there are a few neighbors close to the project, the power generation is quiet, and should neighbors come in closer over the 25-year life span of the solar farm, sound won't be an issue. The site LRE chose was a piece of land that had once been actively used for agriculture but had since been reclaimed over the years by brush and trees. "This made it an ideal setting for a solar farm because, in New Jersey, it's important to make the perimeter of solar sites visually pleasing and the scrub brush and the mature trees that we left around the outside provided a natural viewshed." Although one of the benefits of the location was its vegetation, clearing excess brush and trees was also one of the challenges. Of the parcel's 101 acres, 84 acres had to be cleared for the 62-acre plant. The vegetation that was cleared was recycled and ground up into 47,000 cubic yards of mulch. "We had to take out about 14 more-mature trees because they caused either a shade issue to the plant or were danger trees, meaning if they were to fall, they would fall into the fence or into the plant itself," said Stone. "They will be replaced in the perimeter with smaller trees of like species." LRE worked closely with Quanta Renewable Energy Services (QRES) and The Ryan Company (Ryan), both wholly owned affiliates of Quanta Services. "We hired Ryan on a turnkey basis," says Stone. "They proposed Yingli modules, and after we did our due diligence and talked to them about the layout optimization, we agreed. QRES provided the engineering and procurement and Ryan the construction." QRES chose the YGE-235 series high efficiency, multi-crystalline modules, which deliver a module efficiency of more than 14 percent. "Ryan and QRES had worked with these modules before and understood the racking systems required and the installation processes, so we felt that Ryan would bring a more efficient construction effort," adds Stone. "And because they had done the engineering, they knew how many modules to put in strings and how to optimize the layouts." LRE also chose Satcon Technology Corporation inverters, based on QRES's recommendation. Satcon delivered ten 1.0 MW Prism Platforms configured with the company's Equinox inverters. Satcon says that the Prism Platform is its turnkey utility-grade multi-megawatt building block, complete with factory-integrated step-up transformers, MV disconnect switches, and power-conversion electronics. LRE broke ground in July 2011 and had no idea what kind of challenging weather they were in for. In August, Hurricane Irene blew through and it was followed by a snowstorm in October. If that wasn't enough, the New Jersey site experienced an earthquake as well. The 101-acre Oak Solar site contains 53,200 fixed Yingli solar panels and is the largest nonutility-owned solar project east of the Mississippi, according to Lincoln Renewable Energy. Luckily, when Hurricane Irene came through, there were no modules on site, and the Ryan crews worked to make sure everything that could potentially fly around was tied down. Because you can't dictate what Mother Nature is going to throw your way, Stone says it's important to build extra days—"float days"—into the schedule. "We certainly did that and still worked six and seven days a week for the last couple of months to make up some of the time." When construction was at its peak in November, there were 145 workers on site, with Ryan's subcontractor using IBEW Local Union 351 electrical workers for electrical portions of the project. The schedule called for workers doing final onsite clean-up for six months following. In the end, despite the dreadful weather, the project came in on schedule. And with some accelerated commissioning items required because of weather delays, the construction also came in on budget—$41 million. In mid-December 2011 the testing of the solar project was complete. With the construction and weather difficulties behind them, everything was working well. The Clarity Monitoring System by Solar Power Technologies (SPT) will be installed during the first quarter of 2012. SPT and LRE are working through some of the preliminary design decisions. LRE will monitor the site productivity via the Internet using ArgusOn. "They are an SPX company, and they are doing our remote monitoring from Franklin, Tennessee," says Stone. "They monitor the plant on a daily basis, updating it every 15 minutes, providing Ryan (who is also the O&M Contractor) and us with periodic production and status updates." "SPT intends to bring a better monitoring solution that will provide better efficiencies for the solar plant," says Stone. At 10 MW, the New Jersey Oak project is the minimum size for LRE—10 MW being the floor and about 50 MW being the ceiling. However, Stone says they might build bigger projects than 50 MW if the conditions were right. "We have to have absolutely the right land and the right energy offtake. It's all dependent on the financial modeling and other project components." key. "In the finance business, it's all about relationships. Our vice-president, finance, had discussions with Macquarie and found that they had an appetite to buy some solar energy, and we, in turn, had a project that fit the locale that they wanted to buy the energy from. The timing was right, so the deal came together." LRE's development team now has greenfield projects in 13 states. The company is continually looking for the right packages, which includes the right land, customers, and financing, among other things. Looking into the future, Stone would like to see a national energy policy that's got some strength to it. "I think we need a national RPS that will help some of the other states get on board with renewable energy. But even so, I think the solar market is going to become more robust. I think as prices continue to come down on modules, there's going to be more appetite for solar energy." Although there were challenges during the project, LRE says that the people of Fairfield Township definitely weren't one of them. "They had some very exacting requirements, which we were able to meet," says Stone. "In fact, they are now using our package as a benchmark for other companies that are developing in this area." Some of the Township's concerns centered on environmental issues. For instance, they required a 10-foot fence to keep deer out of the area and also infiltration basins around the site so that the water from the site didn't flow off the site. "We also created a special grasslands habitat that requires a unique mixture of grass and field seeds that grow to a maximum height of about 12 inches. But it also supports the small rodents and things like that, that will certainly be within the plant," adds Stone. With the project complete and the plant running smoothly, Stone is proud of the outcome and his team. "This is Lincoln's first utility scale project, and I'm particularly proud of having been able to build this on the timeline and budget that we established. We had a good group on this project, from the Ryan and QRES folks, who organized labor on site, through our owner's representative from Rev1 Services. We all worked together as a team, and I think without that, we wouldn't have been as successful." The team will probably be together again, as LRE and Quanta Renewable Energy are already talking about future projects.